This week’s fiction offering from Nisaba Press is “In the Shadows,” a new short story set in the City of Adventure, written by Richard C. White. For just $1.99, you can download this rollicking tale in your choice of PDF, ePub, or mobi (Amazon Kindle). Or all three! We’re not the captain of your ship. Nisaba Press is the fiction imprint of Green Ronin Publishing. Nisaba will be publishing novels, anthologies, and short fiction tied to the rich and varied worlds of Green Ronin’s tabletop roleplaying properties. Current plans include stories of swashbuckling horror in the fantasy world of Freeport: City of Adventure, tales set in the romantic fantasy world of Aldea from the Blue Rose Roleplaying Game, superheroic adventures set in the world of Earth-Prime from Mutants & Masterminds, and chronicles of fantasy survival-horror in the world of The Lost Citadel. “Night of the Witch” is a short story set on Earth-Prime, the core setting of Mutants & Masterminds and Sentinels of Earth-Prime. It’s Halloween Past, and Seven finds herself wrapped up in an eldritch conspiracy that will force her to team up with Lantern Jack to save the city. For just $1.99, you can download this 16-page short story in your choice of PDF, ePub, or mobi (Amazon Kindle). Or all three! https://greenronin.com/wp-content/uploads/2018/02/GRR70006_200.jpg 300 200 Evan Sass //greenronin.com/wp-content/uploads/2017/07/RoninBanner-1.png Evan Sass2018-02-15 17:20:022018-03-14 14:02:40Earth-Prime Fiction: "Night of the Witch"
Marn the Rose Knight is used to saving the world, but can Kiyn help her learn to save herself? Or view our entire Nisaba Press fiction catalog here. Today we introduce Part Five of our Return to Freeport Pathfinder-compatible PDF adventure series. Freeport is known for its adventures, from Death in Freeport (the one that started it all!) to the mega-adventure Black Sails Over Freeport. Now the City of Adventure goes back to its roots with Return to Freeport! This six-part adventure series for the Pathfinder RPG is a new way to begin your Freeport adventures. 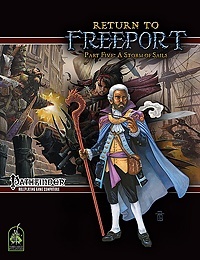 In Return to Freeport, Part Five, the adventurers set sail once more from the City of Adventure, to protect the pirate port from a vengeance-hungry fleet from far southern waters. You can buy A Storm of Sails in our Green Ronin Online Store. Looking for more Freeport action? You’ll probably enjoy these two short fiction pieces set in the City of Adventure! Each is just $1.99, and comes in three formats for your device(s) of choice (PDF, mobi, and epub). Brought to you by Nisaba Press, Green Ronin’s new fiction imprint! A naive cabin boy goes ashore in Freeport for the first time, and learns important lessons about life in the big city, why attention to proper knot lore matters, and about the sailors’ code. A new ship’s crew of unusual composition tacks against the wind to establish their places on the seas and in Freeport: The City of Adventure. Today we present a new short fiction piece by Dylan Birtolo, set in Freeport: The City of Adventure. In “Unlikely Tides,” a new ship’s crew of unusual composition tacks against the wind to establish their places on the seas and in in the city. The latest entry in our ongoing short fiction series, “Everyone: This Is Kevin” is a short story set on Earth-Prime, the core setting of Mutants & Masterminds and Sentinels of Earth-Prime. Even robot superhero boys need to go to school, but Kevin soon learns that there is more to an education than pencils and chalk. https://greenronin.com/wp-content/uploads/2018/01/GRR70003_200.jpg 300 200 Evan Sass //greenronin.com/wp-content/uploads/2017/07/RoninBanner-1.png Evan Sass2018-01-25 14:00:312018-03-14 13:56:22Earth-Prime Fiction: "Everyone: This Is Kevin"
Today author Lindsay Smith brings us “Heartsong,” a short story set in the World of Aldea, the setting from our our Blue Rose RPG. In this 14-page story, an agent of the Silence finds himself at a moral crossroads when he meets a rhy-bonded Jarzoni priest-adept. For just $1.99, you can download this tale in your choice of PDF, ePub, or mobi (Amazon Kindle). Or all three! It seems like just yesterday I was wondering if this Y2K bug would indeed wreak global havoc (spoiler alert: it didn’t) while working on plans to start a new game company. Now here we are 18 years later and Green Ronin is still going strong. Although last year was challenging in many ways, we are starting 2018 in a great position. We have a bunch of projects nearing completion, fantastic new games in the works, and great prospects for the future. Today I’m going to talk about our plans for the next six months. I’ll then do another one of these in June to discuss the second half of the year. been leading the team designing the core rulebook. In a few months we will be Kickstarting The Expanse RPG and the rules will actually be done before we even start the crowdfunding campaign. The game uses our popular Adventure Game Engine, as previously seen in our Dragon Age, Fantasy AGE, and Blue Rose RPGs. We’re excited to take AGE into the future! The Expanse RPG will release in August, debuting at GenCon. Want a new AGE game before the summertime? We’ve got you covered! Modern AGE launches in the Spring thanks to the hard work of Malcolm Sheppard and his team. The game lets you run games anywhere from the Industrial Revolution to the near future, with or without supernatural powers as you prefer. 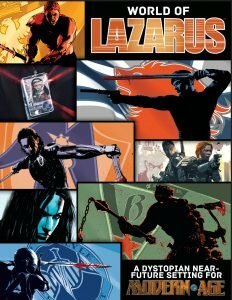 Concurrent with that we’ll be releasing the World of Lazarus, a campaign setting based on the amazing Lazarus comic by Greg Rucka and Michael Lark. Its compelling setting provides some timely commentary on current political trends and is a great place to tell stories. Fantasy AGE and Dragon Age fans will be delighted to hear that two long awaited books are nearing release. Jack Norris and his team have finished the Fantasy AGE Companion and Faces of Thedas and both are now in layout. 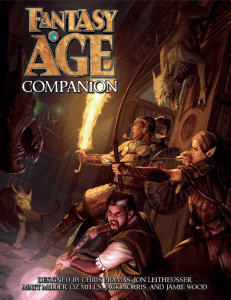 The Fantasy AGE Companion is the first big rules expansion for FAGE, offering up many ways to expand your game. Faces of Thedas brings a plethora of Dragon Age characters from the video games, novels, and comics to life, and adds some great new rules for relationships and romance. 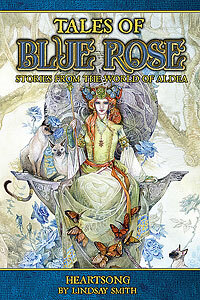 Speaking of romance and fantasy, Joe Carriker and his team have been working on the next book for our Blue Rose RPG. Aldis: City of the Blue Rose is a comprehensive sourcebook about the capital of the Kingdom of Aldis. We are kicking off 2018 with a bang with the release of the new edition of Freedom City, the signature setting of M&M since the game’s first edition. It releases to stores this week so now is the time to check out the city that started it all. Later in the Spring we’ll be releasing Rogues Gallery, a new collection of villains for your campaign. Crystal Frasier skillfully shepherded both of the books to completion, though they were begun by her predecessor. The first book she led from start to finish was actually the World of Lazarus but you’ll be seeing more of her vision of Mutants & Masterminds later in the year with the Basic Hero’s Handbook and Superteam Handbook. Last year we hired Jaym Gates to start a fiction line for us, and this year her diligent work will pay off as Nisaba Press takes off. We will be releasing short fiction from our various settings monthly, and releasing two novels a year. The first will be Shadowtide, a Blue Rose novel by Joe Carriker. We’ll be following that up later in the year with our first Mutants & Masterminds novel. At the start of this article I mentioned the beginnings of Green Ronin back in 2000. The company’s very first releases were Ork! The Roleplaying Game and Death in Freeport, a modest adventure that launched our longest running property. The new edition of Ork is finished and entering layout. It’s great beer and pretzels fun. 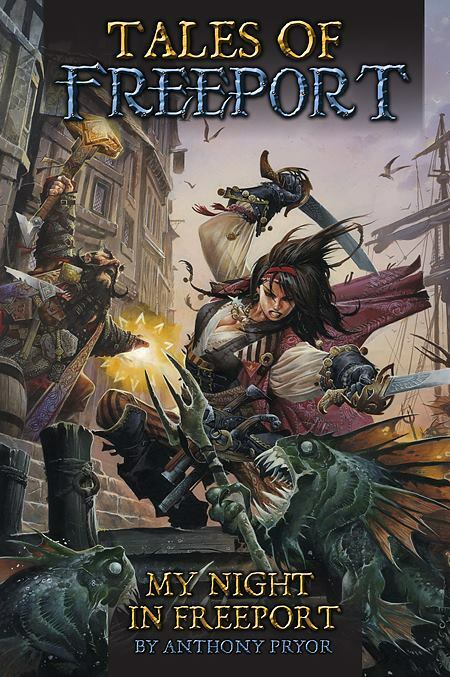 Return to Freeport is a six-part Pathfinder adventure coming later in the Spring in which Owen K.C. Stephens and his team really captured the feel of the City of Adventure. All good things must come to an end and such is the case with our beloved Song of Ice and Fire Roleplaying. Our license expired in 2017 so there will be no new material forthcoming. We can continue to sell the books we’ve already released, however, so those will remain available to those who want to adventure in Westeros. Our series of compatible Chronicle System PDFs will also continue, first with Desert Threats, a new collection of creatures. Some of the rules material from our last planned SIFRP book, the Westeros Player’s Companion, will be released under the Chronicle System brand with the Westeros specific content removed. As you can see, we’ve got an action packed six months ahead of us. 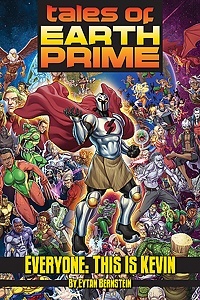 Later in the year we’ve got excitement like the Sentinels of Earth-Prime card game and the Lost Citadel campaign setting for D&D 5E. Thanks for your continued support! We really do appreciate it. Here’s to some great gaming in 2018! Hi, I’m Jaym Gates, Line Manager for Green Ronin’s Nisaba Press. We’ll be publishing fiction tied in to the Green Ronin properties, both short fiction and novels. I was given three missions: make a great fiction line, make sure it was a great diverse fiction line, and find some great new voices for both fiction and RPGs. That’s pretty much the most exciting mission plan you could give me, for anything. Why? I got into editing because I discovered how amazing it was to find those incredible new voices that no one else has found yet. There is also something intensely rewarding about taking a good piece of fiction and refining it to its best form. As we’re releasing our first batch of regular stories, I wanted to talk a little bit about tie-in fiction, and why Nisaba. First off, one of the best things about tie-in fiction to me is that it gives fans new stories and elaborates on beloved settings. Flavor text in RPG books is great, but sometimes you really want to go on an adventure with characters. See the sights of Emerald City, smell the sweet reek of Freeport, maybe feel the wind on your face as Rezeans gallop across the plains. While we can’t LITERALLY give you all of that, fiction gives windows to the new and existing characters in our settings. Maybe they’ll inspire new adventures, show up in your existing adventures, or just be a brief excursion with a fictional friend, but any way it goes, we love giving fans the chance to interact at more length with our settings. It’s also a great way to get your RPG fix if you don’t have time to game, are playing another game, or can’t get a good group. It’s like talking to an old friend you don’t get to see often enough. Secondly, tie-in fiction is a great way for new fans to get involved. There are a lot of settings, a lot of rules, and a lot of history. It can be scary for someone to just jump in at the deep end with no idea what’s going on. A short story or novel takes away that overwhelming feeling of “SO MUCH STUFF” and gives the reader a gentle introduction to a new place. And last but not least: because the world is made of stories, and stories allow the creators to develop things that might never come up in the RPGs, or that might just not have been thought of. Narrative is a unique thing that forces you to think of so many angles that you might not otherwise see. The scents and sounds of a world, the interplay between character and their religion, questions of morality and honor. A story fleshes out what the RPG has built to a level that flashes and flavor text can’t approach. So that is “Why tie-in fiction.” I’m really thrilled with the stories I’ve already been working on. We have Anthony Pryor’s My Night in Freeport, Lindsay Adam’s tale of an Aldean agent and a Jarzoni priest-adept, Eytan Bernstein’s story of Kid Robot’s first day of school, and so much more. All of these are original fiction set canonically in the settings you know and love. My hope is that they bring another aspect of engagement and joy in the setting. And keep an eye out, we’re planning to host an open submission period in a few months, so if you’re wanting to write fiction for Blue Rose, Freeport, or Mutants & Masterminds, get plotting now! https://greenronin.com/wp-content/uploads/2017/10/22814327_10155824023486532_694082410238745943_n.jpg 677 450 Jaym Gates //greenronin.com/wp-content/uploads/2017/07/RoninBanner-1.png Jaym Gates2017-10-30 08:39:032017-10-30 08:39:38Ronin Roundtable: Nisaba Press! Today we present a new short fiction piece by Anthony Pryor, set in Freeport: The City of Adventure. In “My Night In Freeport,” a naive cabin boy goes ashore in Freeport for the first time, and learns important lessons about life in the big city, why attention to proper knot lore matters, and about the sailors’ code. For just $1.99, you can download this rollicking tale in your choice of PDF, ePub, or mobi (Amazon Kindle). Or all three! We’re not the boss of your reading habits.